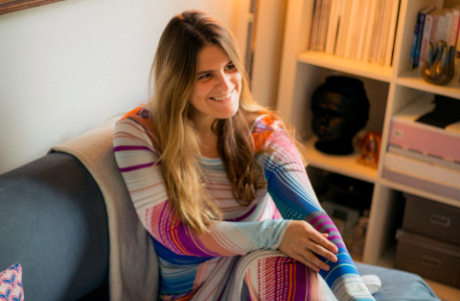 “Fashion has so many designers, collections and products that Tagwalk really wanted to centralize all of the information in a clear and concise way.” Ms. Alexandra Van Houtte shared with Luxe.CO. 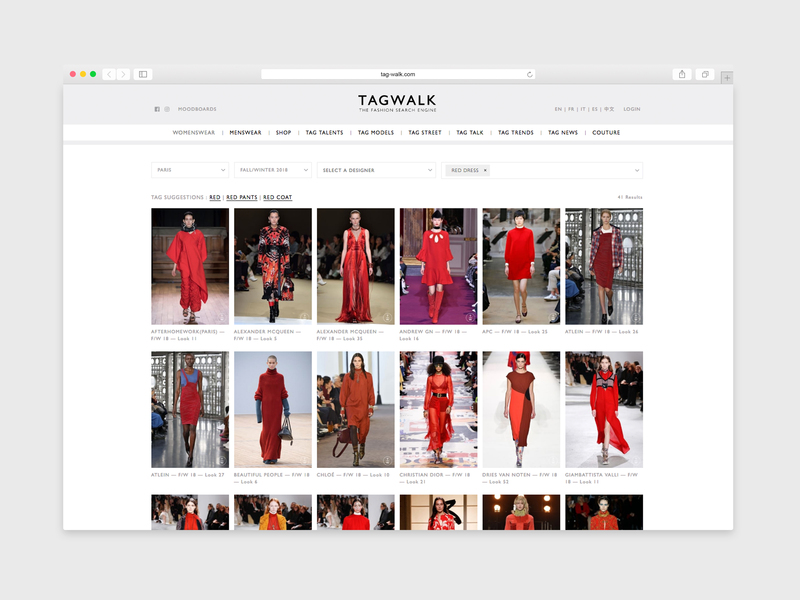 The former fashion assistant at Numéro in Paris launched Tagwalk , the first fashion search engine “Google of fashion ”in 2016. The idea for this innovative business is to change the way of fashion insiders, say fashion editors, stylists and buyers doing their jobs. Recalling Alexandra’s own experience, she felt frustrated spending hours searching through the latest runway garments and trends. So she decided to develop a tool to get the work done faster and easier ,and then it’s Tagwalk. At the very beginning, Alexandra hand-picked and tagged every single photos to develop a digital fashion database based on keywords. 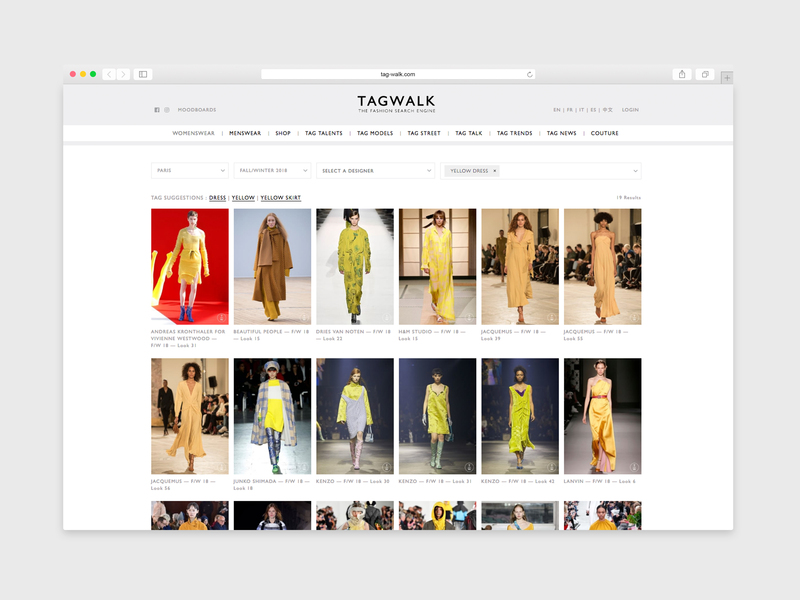 And now Tagwalk is mostly done through artificial intelligence algorithms, collecting more than 2,800 key words and 128,000 photos from the runway shows in Paris, Milan, London and New York for roughly 25000 users searching. Some potential investors doubted that “it’s too niche”, but the Venezuelan businesswoman and angel investor Carmen Busquets saw the potential and value in the Tagwalk. She invested in the start-up when it’s only two month old and she became Tagwalk’s go-founding investor – she also introduced Alexandra to another high profile investor, Hong Kong-based Adrian Cheng （郑志刚）, the founder of K11 Group and C Ventures, which has invested in the likes of Moda Operandi, Armarium, Not Just A Label, and more. In an exclusive interview with Luxe.CO, Alexandra and the investor Adrian Cheng shared with us their insights on running a start-up that is both tech & fashion and investing in the industry. Luxe.CO: How do you define Tagwalk? A fashion driven or tech driven company? Alexandra: Tagwalk is a real mixture of both fashion and tech, which makes it a little complex! We have everything anyone in the fashion industry is looking for but we are driven by complex data analytics and machine recognition. Luxe.CO: What’s the structure of your current team? how many of them are in charge of technology? Alexandra :We have fashion editors, sales, affiliation and three people in charge of technology. We’re a good mix and it balances it out well. Luxe.CO: What’s the biggest problem or needs that Tagwalk try to solve or meet? How did you find this biggest needs? And what are the biggest challenges to solve them? Alexandra: Fashion has so many designers, collections and products that Tagwalk really wanted to centralize all of the information in a clear and concise way. I used to be a fashion assistant and my job was to search for clothes and accessories all day long, I felt the fashion needed a better system, that was easier to user. Luxe.CO: Fashion content usually involve lots of images, celebrities, that means you may have to deal with copyright, what about Tagwalk’s solution? Alexandra: Tagwalk has its own photographer and access to every show, so the picutres belong to us. No copyright problems. Alexandra: Tagwalk has 91% fashion professionals and 76% millenials. 61% of Tagwalk’s users are in Europe, 10% in China and the rest in America. 25% of our users are stylists and 25% are designers. Luxe.CO: Does TagWalk include designers or brands of China? Any further plan for Chinese market? Alexandra: Tagwalk would love to be able to represent Shanghai Fashion Week and younger designers but we haven’t been approached by them yet. Luxe.CO: Could you share some interesting feedback Tagwalk got from users (visitors and professional users)? Alexandra:The only feedback we get is that Tagwalk has helped them gain a maximum results in a minimum time. Luxe.CO: Behind this investment, what attracted you the most about Tagwalk? Adrian: Tagwalk’s concept is essentially solving a problem that’s been nagging fashion editors for decades. To create a Google for fashion – or a fashion Baidu （百度）in China – it’s such a simple idea that will create a massive ripple effect across the industry. Like all great startups on hindsight, it’s a simple but revolutionary idea. Luxe.CO: What are the challenges and opportunities that fashion industry has? Adrian: Already Tagwalk has shaken up the fashion industry and is able to predict trends more intelligently, and such insights, especially when adopted in the China markets, would be invaluable and represent tremendous opportunities for other fashion companies. This also highlights how big data is impacting every industry, and the fashion world is no exception. Alexandra went on to intern at Lanvin and then became a full time fashion assistant, working on photo-shoots for numerous publications including Glamour France, Numéro, Grazia and Vogue Italia. After five years in this role, Alexandra became increasingly aware that the way fashion was referenced needed to change, and her frustration led to the creation of Tagwalk. Entrepreneur Adrian Cheng （郑志刚）is the Founding Partner of C Ventures, a new investment fund focused on building a global ecosystem of Millennials and Gen Z-centered brands and platforms. Cheng also founded K11, a multi-faceted brand rooted in culture that pioneered the museum-retail concept. The Harvard Graduate is also Executive Vice-Chairman and Manager of New World Development（新世界发展集团）and the Executive Director of Chow Tai Fook Jewellery Group（周大福珠宝集团）, the world’s largest jeweler with over 2,400 shops worldwide. Cheng is the Creative Advisor of arts video channel Nowness and has recently forged a collaboration with tech giant Tencent （腾讯）to expand its co-working space concept outside of Mainland China. Co-founded by entrepreneur Adrian Cheng and veteran investor Clive Ng, venture capital firm C Ventures focuses on connecting Western brands to the global market, with its wider portfolio strategically comprising technology-driven brands and platforms in fashion, creative media and entertainment industries, which play to the interests of millennials and Generation Z. C Ventures recent investments include Moda Operandi, Bandier, Dazed Media, Flont, Beautycon, Armarium, Not Just a Label, among others.